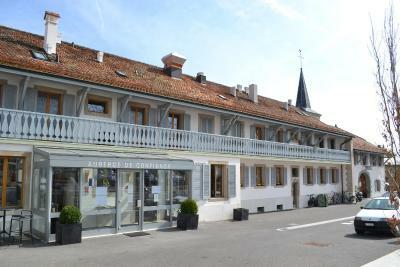 Lock in a great price for Auberge de Confignon – rated 8.1 by recent guests! 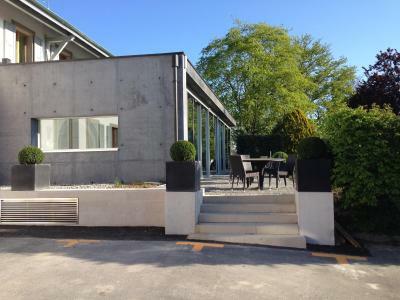 Is was a last minute reservation and Geneva was full but I was delighted with what I found. Buses and trams are reasonably close. If I were not in a hurry I would come with my husband back and will recommend to friends. The auberge is as if in a small village-not like the edge of a major city. The coop nearby was very convenient. 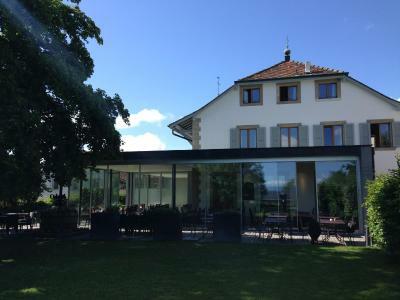 The hotel is in a beautiful location in a quiet village just outside of Geneva. There is a tram stop within .5 kilometers that goes to central Geneva in about 15-20 minutes so its very easy to get to the city. 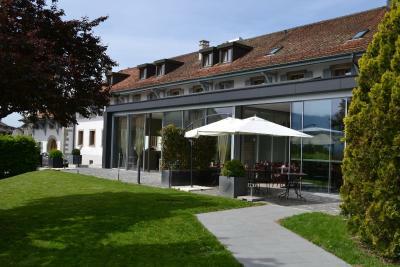 The hotel has a large, beautiful, very peaceful backyard where breakfast can be served in good weather and a solarium when the weather doesn’t cooperate. 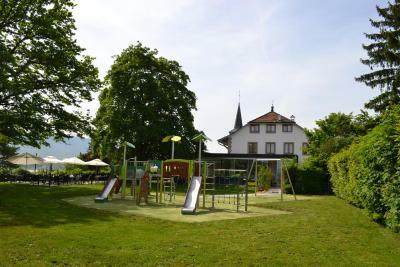 The backyard also has a playground for children. They serve dinner as well and the menu looked very good, although my son and I decided to take the tram to the city for dinner. They also have a large wine inventory. The staff were very helpful lending me an iron/steamer to press the wrinkles out of an outfit. My room was on the second floor and they helped take my bags upstairs. This is a lovely place and I would definitely stay again. Excellent staff, courteous and professional, helped me out with the French menu which had put me a tad out of my depth. Spotless room, comfortable, relaxing place. Location and the staff. I had an unforeseen payment card problem and they were so kind and patient. I felt they were on my side. They went the extra mile ! The person in charge of receiving us was very solicitous and guide us through phone conversation--we arrived on a Sunday. The place was clean and tidy. Breakfast was very good. We did not use the restaurant. Great restaurant, comfortable beds, very clean, very close to airport by car but situated in a very nice residential area. Bed was comfy, room was clean, sheets were crispy, and assorted tea and coffee was also a nice touch. Wifi was excellent. wonderful staff, comfy beds, bottles of water daily for the stay, good towels/linens, beautiful location in country village in the suburbs, enjoyed the free bus and tram tickets provided at hotels in Geneva so the car could be kept in the parking lot..
Auberge de Confignon This rating is a reflection of how the property compares to the industry standard when it comes to price, facilities and services available. It's based on a self-evaluation by the property. Use this rating to help choose your stay! Located in the center of Confignon village on the outskirts of Geneva, Auberge de Confignon is a 10-minute drive from Geneva Airport and 20 minutes by public transport from Geneva’s city center. It offers a gourmet restaurant, a bistro, and free WiFi access. Each room at the Confignon Auberge has a balcony with garden and mountain views, a flat-screen TV, a mini-bar, and a bathroom. 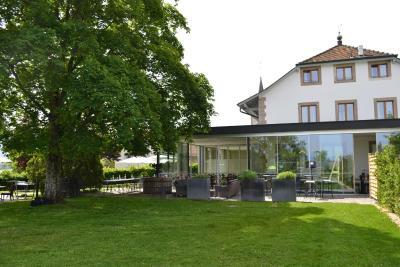 When would you like to stay at Auberge de Confignon? This twin room has a mini-bar and a bathroom with shower. This double room features a mini-bar and a bathroom with shower. Some of the rooms have a balcony. House Rules Auberge de Confignon takes special requests – add in the next step! 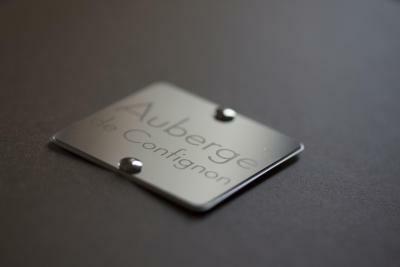 Auberge de Confignon accepts these cards and reserves the right to temporarily hold an amount prior to arrival. Please note that on Sunday, there is brunch instead of a lunch service at the restaurant. On Sunday evenings, only the bistro is available. Please inform Auberge de Confignon of your expected arrival time in advance. You can use the Special Requests box when booking, or contact the property directly using the contact details in your confirmation. They did not offer the free travel pass which we always have-this time not needed as seeing family. Travel not an issue this trip. Opening times of reception during day limited us sprcifally trying to get pass. Door locked. Charged us little bit more than quoted by booking. Com. Church bells are too much for a restful stay every morning at 7.30! My phone reception poor inside hostel. It is not a hotel. Restaurant was closed and this was the primary reason for choosing that hotel. I really cannot think of anything significant. The room, though, was small and since it was a reformed attic, a bit uncomfortable because of the steep roof's angle. Bathroom was too cramped to do much business in. I usually expect a staff member present during the official check-in hours. The check-in instructions arrived just a day before our arrival via email and I missed it. Spacious room. Very friendly staff! Daniel was extremely helpful and nice! Very easy to get to city centre by tram. Only 10 minutes journey. No elevator so be careful if u bring heavy luggage. Ask for lower room. The smell of the towel. Really refreshing. Hotel very near to Coop. Just 80m. Can ask the travel pass for free public transportation in geneva from the hotel. The costs of taxis to the center of Geneva.